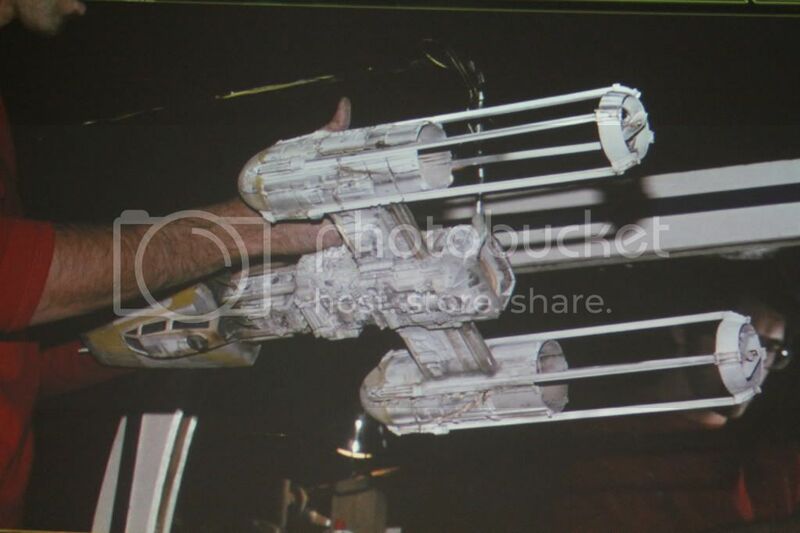 The first model built for filming in December 1975. Only one side was finished. It lacked a cockpit and lights. In the place where an astromech droid would go there is just a grey plug. It was shipped to the UK as reference material for the full size set piece. It was never used in the film. This model has been included in some of the traveling exhibits. Nicknamed as such due to Tie emblem on the front. 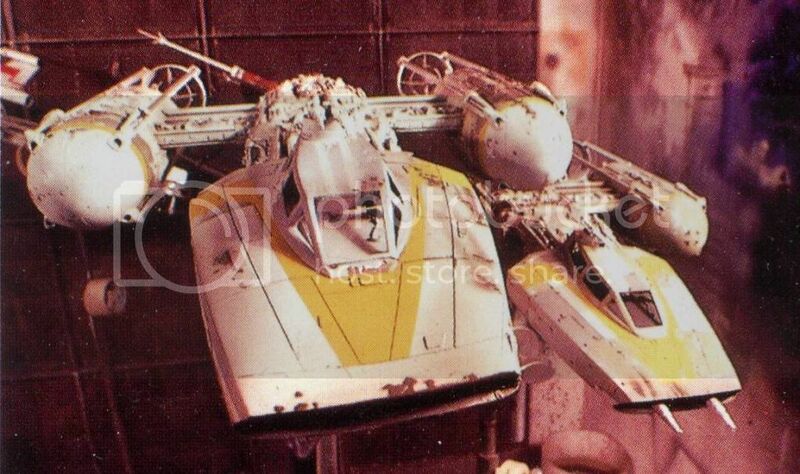 This is one supposedly one of the two hero models used during filming. 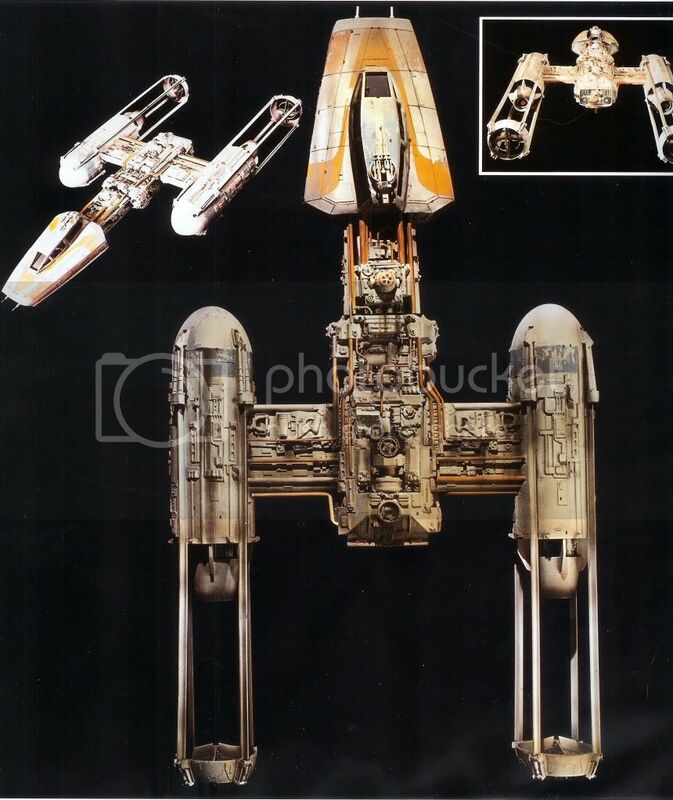 It has a grey domed astromech in some reference pictures, but in the movie it had a black domed R2 unit. That R2 unit though was missing in some shots during the trench run. This is currently owned by a private collector. Nicknamed for the mount cover on the top - look at the LEM Saturn part and instead of an F1 part, it has the tank wheel. 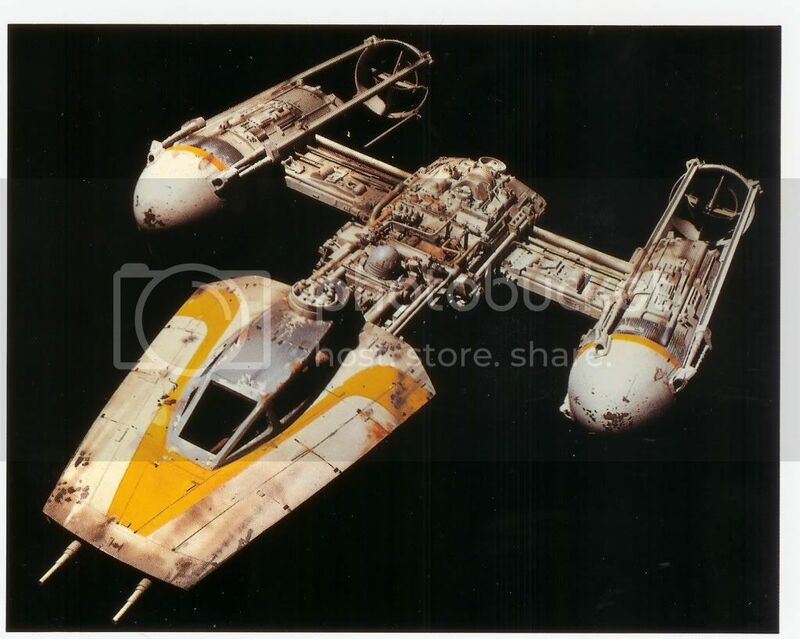 This is the other hero y-wing. This miniature was gifted to Alan Ladd Jr by George Lucas personally after filming wrapped. Alan Ladd Jr ran FOX studios in Los Angeles and was responsible for greenlighting the movie for Lucas when so many other studios had turned it down. 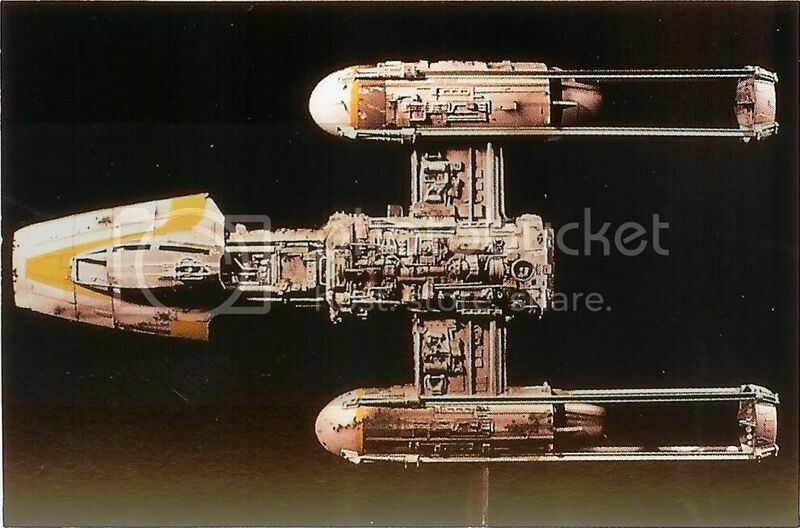 This miniature is seen in close up as three Y Wings form up and start their run on the Death Star trench – it is in fact the first ship that Vader destroys on screen in that sequence (which would have been a pyrotechnic version of this model). 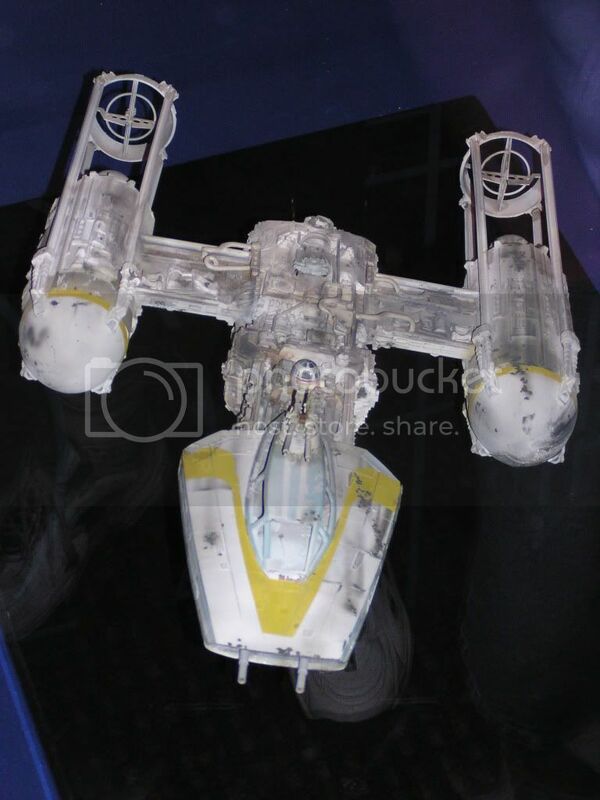 Interestingly the R2 unit, sitting behind the cockpit is removable and in some of the shots you can see that he’s missing completely. It has multiple motion control mounting points and the engines are wired for illumination. Gold 3 is the one on the left in this picture. The other is another pyro model ( triangles?). Gold 3 can currently be seen on tour. It was fixed up for filming Empire Strikes Back by adding lights, cannons and an astromech. The Droid looks like R2-D2, except for a red collar stripe being added. 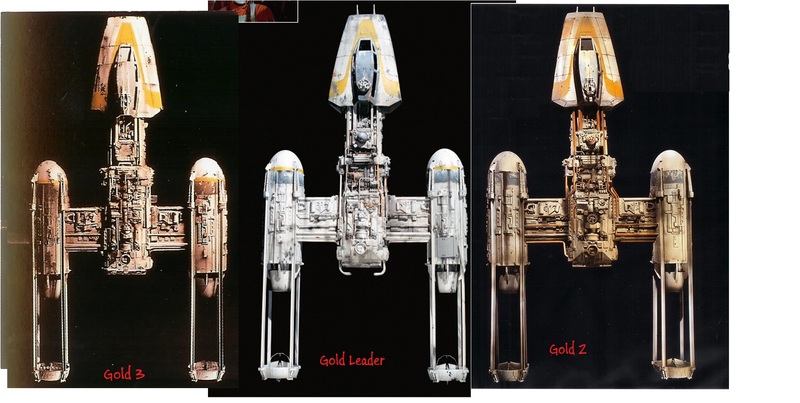 thanks for the reference pics, now I have a clearer idea between all the various y-wings.